Perhaps you also have hornworms eating your tomato plants? 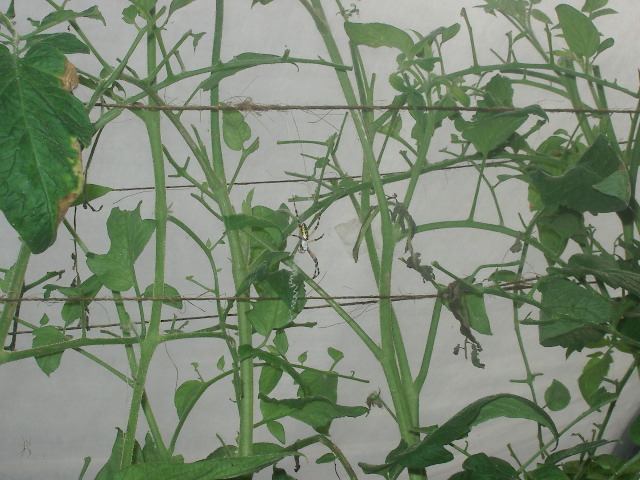 The upper leaves stripped to stems, the fruit munched, and big fat caterpillars getting bigger and fatter? 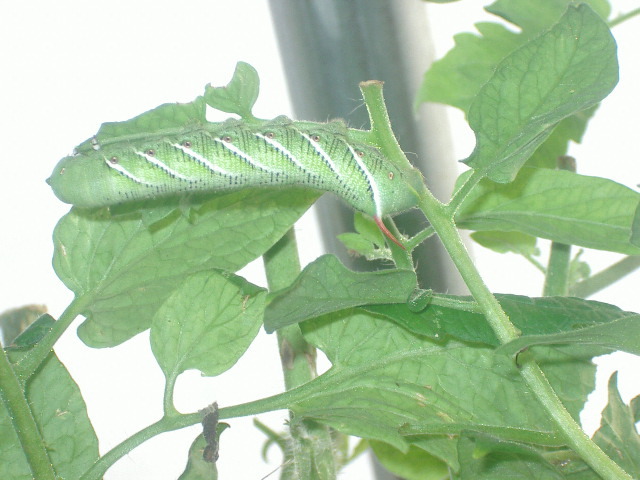 Ours are tobacco hornworms, not tomato hornworms, but both are bad news. Fifty years ago, the Twin Oaks land was a tobacco farm. Tobacco hornworms have a red (not black) horn, and diagonal white lines, not arrowhead vees. Outdoors our hornworms often get parasitized by a tiny braconid wasp whose larvae develop white rice-grain-like cocoons sticking out of the back of the hornworm. But the parasitic wasps don’t usually fly into the hoophouse, so we have to provide the pest control ourselves. We could prevent the night-flying hornworm-mother Carolina sphinx moth or Tobacco hawk moth from entering our hoophuse by closing it up every night, but we don’t want to do that, as it means we have to reliably open it every morning before it gets too hot. 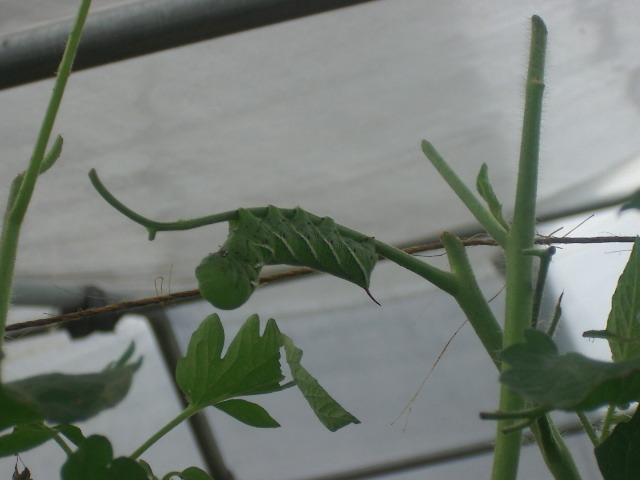 Hornworms strip the upper tomato leaves until only stems remain. When I find these beasties, I pull them off the plants (it can take quite a tug, their legs are strong), drop them on the ground and stomp on them. They can grow to be 4″ caterpillars. 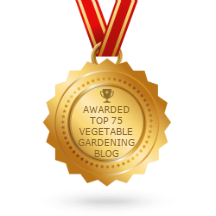 One day when I’d finished my safari along the first tomato bed and was working my way along the back of the second bed, I saw a cardinal fly in twice and fly off with a dead hornworm in its beak. I guess they can’t tackle live ones. (If only . . .) I’m intrigued by how they knew I had provided dinner. Did they smell the hornworms? Or see the dead ones on the path? Sight seems more likely to me than smell. So, why are these big caterpillars hard to find? You might imagine such big worms with such vivid stripes would be easy to see, but not so. 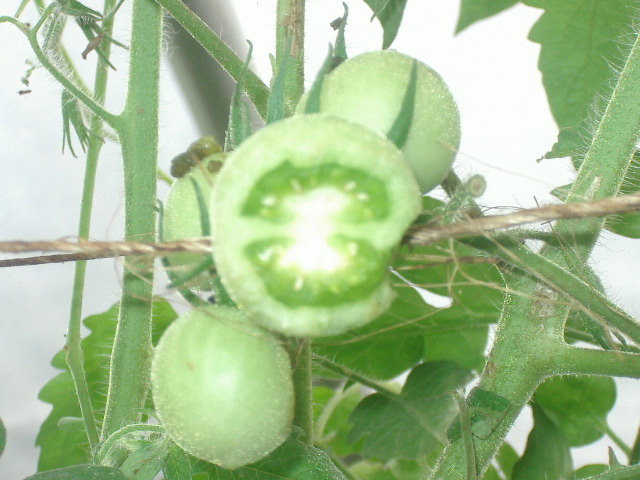 They are, of course, the exact same shade of green as tomato leaves. Curled tomato leaves can look remarkably similar to hornworms. The stripes mimic the veins on the undersides of the leaves. I do my hornworm hunting when it’s warm but not too hot, on the theory that then the caterpillars are more likely to be active, rather than snoozing in a sheltered spot. I walk along the row looking for damaged leaves. When I find some, I gaze at the area, looking for discrepancies in the pattern – bare stems with lumps on them. Usually the caterpillars are on the underside of a chewed stem, and often (but not always) they have their heads raised as in my second photo. Hornworm poop on tomato leaf. If I see damaged fruit, I redouble my efforts to find the culprit. 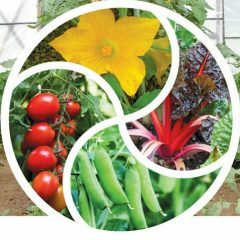 If I still can’t see the worm, I sway a bit from side to side, viewing the plants from various perspectives. Sometimes I scrunch down a bit, so that the top of the plant is back-lit – that helps. Hunt frequently, every day or two. Knowing the signs of hornworm presence can save you time looking high and low. Instead you focus your attention on where you are most likely to find them. I am in Stafford, Va(22556). Just north of your location. I seem to have a population explosion of tobacco hornworms this year. Normally only have a couple on my tomato plants. This year I have found way too many. Also none have the egg cases of the paraisitic wasps as in years past. I use no sprays on our property. Any ideas as to why? Also next year if I were to buy wasps what would be the timing of the release? I very much enjoy your posts!! Thank you!! Bt is an organically approved pesticide spray that kills small caterpillars, without killing other insects. I don’t know how well it works on hornworms once they get big. 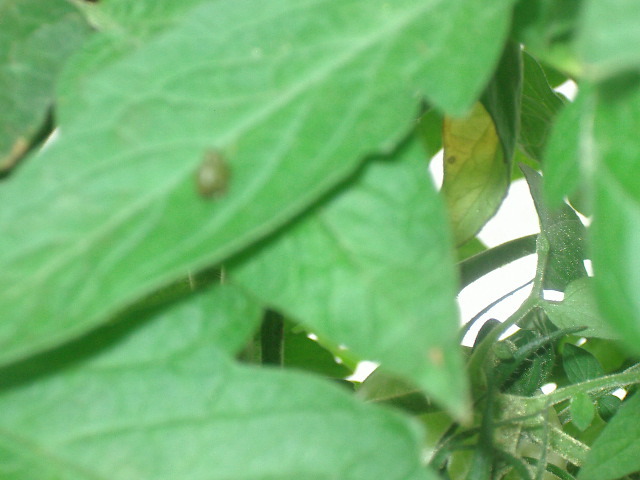 Make sure you get the Bt for caterpillars, not the ones for Colorado potato beetle or mosquitoes. I don’t know if you can buy the parasitic wasps. Try Koppert. Or keep hunting! Last year I also had a cardinal going after a hornworm. That was the only live hornworm I saw last year as the wasps had done their job VERY WELL. This year we moved our tomatoes– not so fortunate. We are in Upstate South Carolina. Which kind of wasps go after your hornworms? I think our Virginia wasps are too timid!